“Visitors coming to Branson have a wide variety of lodging to pick from offering great choices for just about every need and budget,” said Annette Wood, Director of Group Sales for the Branson Tourism Center. “The Radisson Hotel, ideally located in the center of the famed Branson Strip, is known for its outstanding hospitality, customer service, cleanliness, and the capability to host, not only individuals and families, but large groups, conventions, and other, events,” she added. Yvonne Costales, Director of Sales and Marketing for the Radisson, said that the hotel was built originally in 1994 and was completely renovated from top to bottom between 2012 and 2014. “Everything is ‘brand new’ including our 472 rooms and suites, common areas, the lobby, the ‘Wildwood Bistro Restaurant’ and our updated sports bar, the ‘Time Out Sports Lounge,’” She added. When asked what the number one reason would be for Branson visitors to select the Radisson she, without hesitation, said, “Guest services is a priority for us. We have a motto called, ‘Yes I can’ designed to make sure that we do everything we can to make the stay of our guests as pleasurable as possible. This empowers many of our employees with the authority to make on the spot decisions to ensure sure that happens without delay.” She also points out that this service starts with a great selection of guest rooms to meet just about every need, a full set of amenities, both in and out of the room, and one of the best locations of any hotel in Branson. The hotel has 472 rooms with 322 standard double bedded rooms, 123 king rooms, 22 king leisure suites, 4 Presidential Suites, and a Penthouse. Costales said that with the number and variety of rooms they have, and that many of the rooms and suites are adjoining and or connected, that the hotel has the flexibility to meet just about any lodging need from a basic room, to suites for the family or business traveler. Each room comes with a complete set of amenities. This includes a refrigerator, 37″ flat-screen TVs; complimentary high-speed, wireless Internet access; work desk with ergonomic chair; two-line telephones with voicemail and data ports; easy chair with ottoman; hair dryer; iron/ironing board; coffee makers, and much more. The Radisson has free parking; a heated indoor/outdoor pool; a Fitness Center, set up and outfitted by Precor; a whirlpool and sauna, and a business center. It also offers a separate on-site restaurant and lounge; a full service concierge desk to assist with transportation, tickets for local events and more. Although not thought of by most people in selecting a hotel, its location, only a block off the center of the famed Branson Strip, on Wildwood Drive is ideal. By simply turning left, south, when exiting the hotels main entrance and going one block guests have immediate access to Branson’s Alternate Colored Yellow Route which permits a lot of flexibility in avoiding Highway 76’s traffic. It’s a ten-minute or less walk from Walmart; Grand Village Shoppes; Andy Williams Performing Arts Centre and Theatre, Kings Castle Theatre, three different Go Kart Tacks, Ride the Ducks, two miniature golf courses, the Thousand Hills Golf Course, and many other activities. In terms of eating conveniently and restaurants, it would be hard to image a better location. In addition to the hotels in house “Wildwood Bistro” and the “Time Out Sports Lounge” there are over a dozen eating establishments within a 10-minute walk of the hotel including Dairy Queen, Panera Bread, Shorty Smalls, Lone Star Steak House, Florentina’s Ristorante Italiano, McDonalds, Mel’s Hard Luck Diner, Subway, and many others. 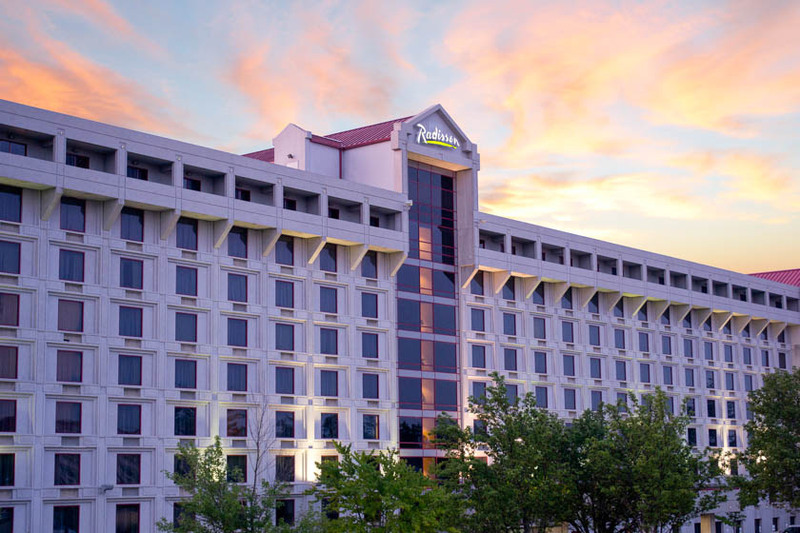 The Radisson Hotel is also a participant in the Branson Tourism Center’s (BTC) Lowest Rate Lock Guarantee Program. If you book your stay at the Radisson through BTC, subject to the programs minimal conditions, the price you pay is guaranteed to be the lowest rate available. If you find a lower price offered for the same room on the same dates anytime between when you book your room and when you arrive in Branson, BTC will match the lower rate. The Ball Room set up, in one of its many possible configurations, for a dinner event. The Radisson has over 17,000 square feet of meeting and event space under “one roof;” those attending meetings or events do not have to go outside at all or be otherwise be concerned about the weather in getting from their rooms to their conferences or events. It’s the only Branson Strip hotel, and one of only three hotels in Branson, capable of providing this type of service for such large conferences and events. Costales points out that those 17,000 plus square feet are configurable to meet the needs of large conferences and events to the smallest, providing group and meeting planners with the utmost flexibility in planning their event. She said that it can be divided up into 17 rooms, the largest of which would the Ball Room with 6,058 square feet and the smallest which would be Sky View room with about 650 square feet, with a large variety in between. 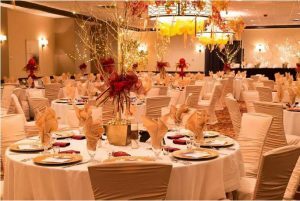 She believes that the Radisson is ideal, for not only the large groups, but for those planning smaller events such as reunions, weddings, and similar gatherings. “Our location, dedicated Groups Department, the range of services, including catering, that we offer, and the flexibility of our meeting space make the Radisson an ideal place for both large and small meetings, conferences, or other events,” Costales added. For more information or reservations for the Radisson Hotel or for additional information on any of Branson’s lodging please contact the Branson Tourism Center, one of Branson’s largest and most respected vacation planning services, by calling 1-800-785-1550 or through their website www.BransonTourismCenter.com. This entry was posted in Branson Lodging, Featured on August 17, 2016 by Gary Groman.